Take the World`s Best Courses, Online and For Free! 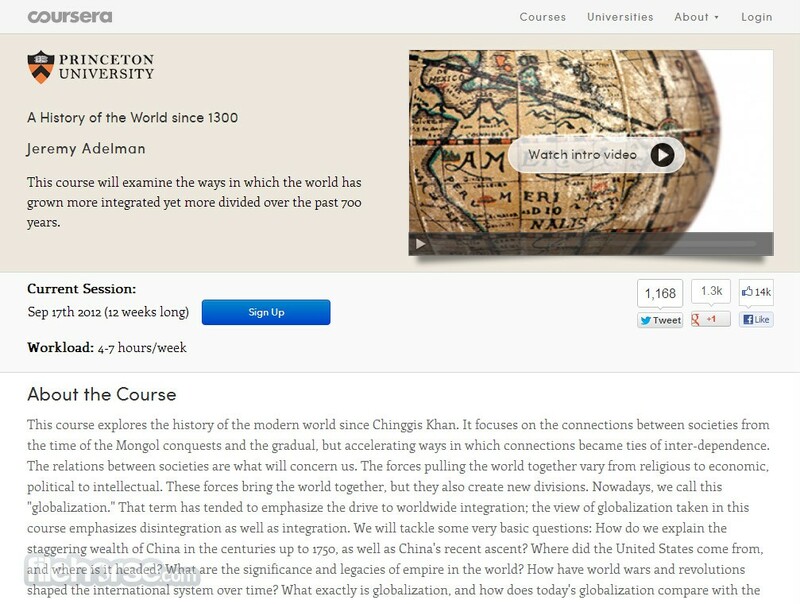 Coursera is a one of the internet’s best destinations for online courses. This expansive web application is filled with millions of people who are using it every day to learn basic and advance courses, interact with thousands of their fellow students and learn in a collaborative environment that will surely fulfill your every need. Coursera currently offers courses from 20 categories (Biology, Mathematics, Law, Medicine, Computer Science, etc. ), and is officially accepted as one of the crucial learning tools in 33 universities from all around the world. All courses are created by world-class professors, lectures are filled with interactive material, large online community will always be one click away and ready to answer all your questions, and all lectures are based on sound pedagogical foundations that will enable you to master new concept and knowledge quickly and effectively. If you are student, or want to enhance your knowledge for your rising career, Coursera is the perfect online learning destination for you. Learn anything you want online directly from our browser! Online learning services have long time tried to create curriculum that could most effectively transfer knowledge from the pages of user’s browsers into their brains, which is not a simple task. After years of experience in working with students, two university professors from Stanford Daphne Koller and Andrew Ng decided to create online school that will offer absolute best education possible to everyone who is willing to learn. In 2011 they founded Coursera.org, which very quickly amassed large only student body that came from all four corners of the world. With the help of many college professors from best known schools in the world, their catalogue of lessons grew, making from Coursera - Free Education Online one of the known for massive open online courses. 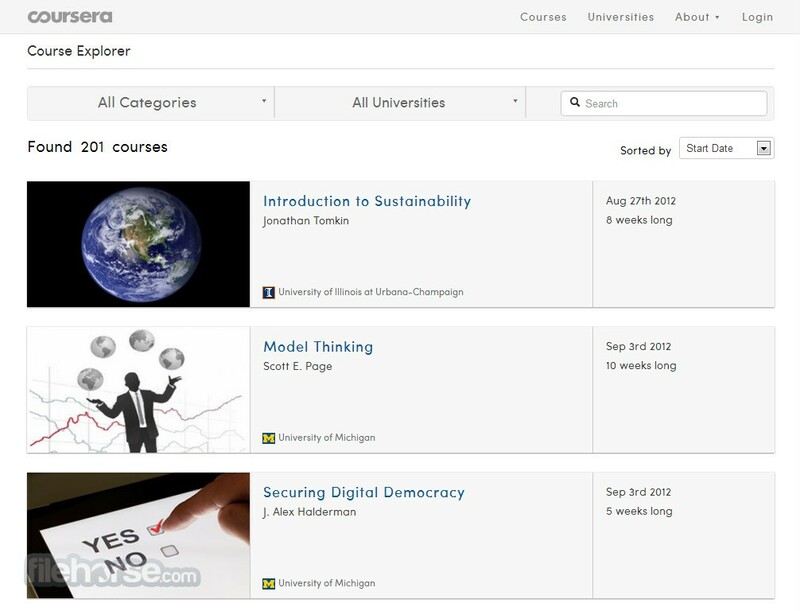 Coursera is an online designation that hosts very large array of free courses that were created by some of the most popular universities from all around the world. As of early 2014, Courseraoffers over 20 learning categories that hold over 400 free courses that were created by 85 Universities (Stanford, Princeton, University of California,University of Michigan...) from 16 countries. All lectures are specifically crafted to enable easy acquisition of knowledge and understanding of real-world data that you can use in your daily life, personal projects, school and work. Learning process that Coursera uses is focused on comprehensive schedule that involves sometimes months of work with few hours of work each week. Lesions can involvein-depth articles, exams, workshops, videos, discussions, and ability to directly engage with other students and instructors. All work is done at your own pace, with ability to get answers to questions from Coursera community and university professors who are often instructors who are leading numerous online classes. Some classes will offer letters of completion that you can use in your CV while searching for a new job, although those letters will not have any impact on your college credit score. Coursera became famous not only because of its great learning schedule, but because it was founded by well-known university professor and because many famous experts are regularly leading new and innovative education projects that anyone can access and learn from. 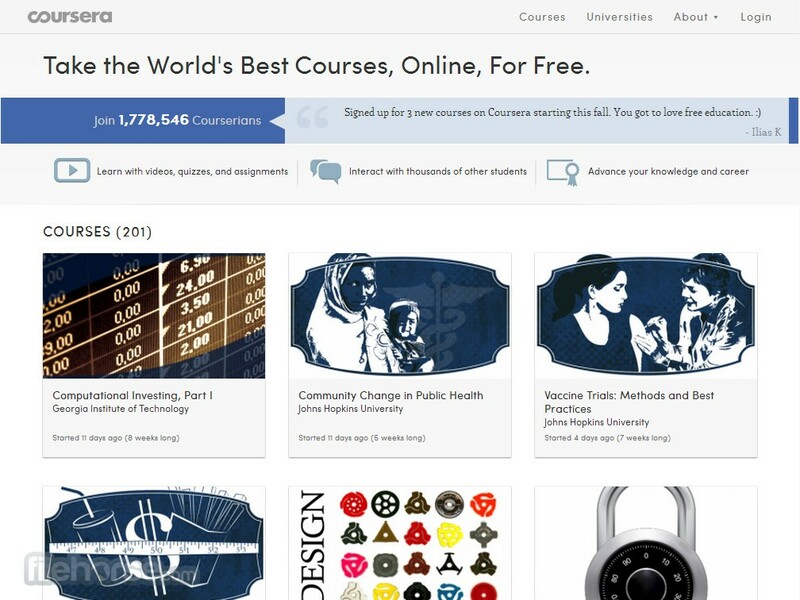 Coursera has one of the best interfaces we have seen in an online education service that is offering its entire curriculum and features for free. Main page features basic navigation options on the top, search bar that can search through 590 courses from 108 education partners, and below search bar you can see breakdown of 12 most popular and recent courses. Coursera courses are separated in several categories, starting from languages (12 most popular ones), and 25 other categories that cover everything from arts and biology, to medicine, physics, social sciences and professional teacher development. Pages for each course hold complete data listing of all that you will be asked to do, including schedule and description of leach individual lesson. Free Education Online! 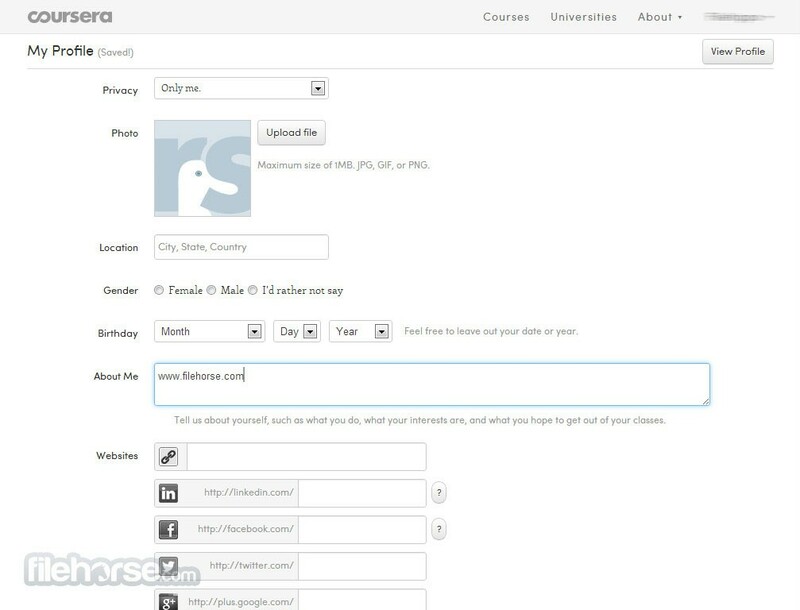 Coursera is a completely free for use for everyone. Site features no ads, no costs for creating new user profile, no expiring dates. This enables much larger student body to become invested in its large catalogue of courses, enabling them to spend as much time as they want with each course. Among all free resources for online learning, Coursera is definitely one of the best. With it you can easily expand your knowledge, prepare yourself for future life challenges, and find job more quickly. Free Education Online! If you enjoy learning new things, Coursera offer you curriculum that will ensure that you learn material that is hosted on the site.